ABSTRACT. Previous studies demonstrated that the crude extract of the ascidian Eudistoma vannamei, endemic from northeasttern Brazil, strongly hinders growth of tumor cells in vitro by inducing apoptosis due to tryptophan derivatives, which are commonly found in bacteria. This study presents a bioactivity-guided screening among actinomycetes, associated with E. vannamei, aiming at recognizing active principles with biological relevance. Twenty strains of actinomycetes, designated as EVA 0101 through 0120, were isolated from colonies of E. vannamei among which 11 were selected for cytotoxicity evaluation. 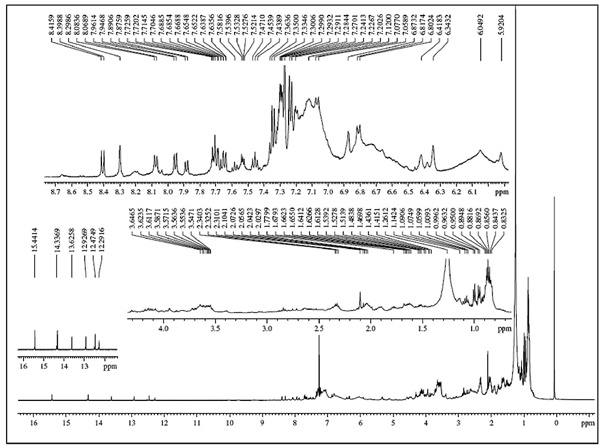 The extracts from EVA 0102, 0103, 0106, 0109 and 0113 were the most active, and were further studied for IC50 determination and chemical analysis by 1H NMR. IC50 values obtained ranged from 3.62 µg mL-1 (for EVA 0109 in leukemia cells) to 84.65 µg/mL (for EVA 0106 in melanoma cells). All active extracts exhibited the same TLC and spectroscopic profiles, suggesting the presence of quinones and other related secondary metabolites. Furthermore, these strains were identified and compared based on their respective 16S rRNA sequences. The results herein identified the five strains as Micromonospora spp. while phylogenetic analysis suggests that they are possibly two different Micromonospora species producing the cytotoxic compounds. Keywords: marine biotechnology, Eudistoma vannamei, marine microorganisms, Micromonospora sp., Brazil. RESUMEN. Estudios previos demostraron que el extracto crudo de la ascidia Eudistoma vannamei, endémica de la costa noreste de Brasil, obstaculiza fuertemente el crecimiento de células tumorales in vitro por inducir apoptosis. El análisis químico del extracto sugirió la presencia de derivados de triptófano, comúnmente encontrados en bacterias. El estudio presenta un screening de citotoxicidad en actinomicetos asociados con E. vannamei, para reconocer principios activos biológicamente relevantes. Veinte cepas de actinomicetos, designados como EVA 0101 hasta 0120, fueron aisladas de colonias de E. vannamei y 11 fueron seleccionadas para la evaluación de citotoxicidad. Los extractos de EVA 0102, 0103, 0106, 0109 y 0113 resultaron las más activas y fueron estudiadas para determinación de la CL50 y perfiles de CCF y 1H RMN. Las CL50 obtenidas oscilaron entre 3,62 (EVA 0109 en las células de leucemia) y 84,65 µg mL-1 (EVA 0106 en las células de melanoma). Los extractos activos presentan el mismo perfil de CCF y espectroscópico, lo que sugiere la presencia de quinonas y metabolitos secundarios relacionados. Además, las cinco cepas fueron identificadas y comparadas sobre la base de sus secuencias de 16S ARNr. Las que se identificaron como Micromonospora spp. y el análisis filogenético sugiere que sean por lo menos dos especies de Micromonospora las que producen los compuestos citotóxicos. Palabras clave: biotecnología marina, Eudistoma vannamei, microorganismos marinos, Micromonospora sp., Brasil. Colorful soft-bodied sessile marine invertebrates have been a rich source of natural products with biomedical properties for the past 60 years (Baily, 2009; Molinski et al., 2009; Mayer et al., 2010). Among them, the tunicates are one of the most prolific in terms of novel drug prototypes for the anticancer pharmaceutical arsenal (Blunt et al., 2010, 2011). For instance, trabectedin, a tetrahydroisoquinoline alkaloid obtained from Ecteinascidia turbinata, was recently approved for the treatment of soft tissue sarcoma, with the commercial name Yondelis® (Cuevas & Francesh, 2009; D'Incalci & Galmarini, 2010). Additionally, plitidepsin, a cyclodepsipeptide isolated from Aplidium albicans is in advanced trial phase for the therapy of multiple myeloma and other malignant tumors, but has already received orphan drug status for the treatment of multiple myeloma and acute lymphoblastic leukemia (Ocio et al., 2008; Singh et al., 2008). There are mounting evidences that the associated microorganisms are the authentic suppliers for most of the relevant compounds (Zhang et al., 2005; Imhoff et al., 2011). For the ascidians, in particular, there is a compelling amount of information pointing into this direction (Schmidt & Donia, 2010). Despite the oceans are acknowledged as a rich and highly complex microbiological environment, they have only shared their wealth as a natural drug source for the past 10 years. Thus, the study of marine microorganisms as sources of new drugs is still at its youth (Jensen et al., 2005; Fenical & Jensen, 2006; Liu et al., 2010). This study takes part in a pioneer venture aiming to the exploration of the biotechnological potentials of microorganisms, mainly actinomycetes, from the coast of Ceará. The actinomycetes have proven to be a prolific source of new and bioactive compounds (Fenical & Jensen, 2006). The purpose of the present investigation is to find biologically active strains of actinomycetes and evaluate their respective cytoto-xicity, while gathering information on the microbiota associated with Eudistoma vannamei. This species is endemic from the northeastern coast of Brazil and is the most abundant ascidian recorded for the state of Ceará. Previous studies have revealed that its crude extract strongly hinders growth of tumor cells in vitro, promoting further apoptosis (Jimenez et al., 2003, 2008). Specimens of E. vannamei were hand collected at Taiba Beach (03°30'21.23"S, 038°53'40.16"W), located on the northeastern coast of Brazil. Sampling was carried out with the slightest contamination possible, as the material was gathered and stored with sterile utensils. For isolation of microorganisms, five colonies were homogenized in sterile seawater 1:5 (m/v), and aliquots of 20 L were stroked onto Petri dishes containing different agar based media, which may favor actinomycetes growth (modified from Jensen et al., 1991). The following agar-based media were used herein, all added with cycloheximide 0.1 mg mL-1: SCA (Starch Casein Agar, HIMEDIA, prepared with distilled H2O), AIA (Actinomycetes Isolation Agar, HIMEDIA, prepared in 75% sea-water), SWA (Sea-water Agar, 1.8% agar in 75% sea-water) and GYM (glucose 0.4%, yeast extract 0.4%, malt extract 1%, CaCO3 0.2%, 1.8% agar in 75% sea-water). Purity of strains were resolved by sequential re-strikes onto brand new agar plates and pure strains were inoculated in liquid A1 medium (10% soluble starch, 4% yeast extract and 2% peptone in 75% sea-water) for culture maintenance and up-scaled growth (Jensen et al., 1991). Grown media for each pure strain was sampled into cryovials and supplemented with 25% glycerol for storage at -70oC. Initially, pure cultures were inoculated in 500 mL Erlenmeyer flasks filled with 100 mL of liquid A1 medium. Flasks were kept at 28oC and 200 rpm for 5 days. Next, 10 mL of grown media were added to newly assembled Erlenmeyer flasks with 100 mL of fresh media and kept at 28oC and 200 rpm agitation for 10 days. The resulting media was spun down to separate the bacterial biomass from the broth. Biomass was extracted with MeOH 1:1 (m/v) while broth was extracted in EtOAc 1:1 (v/v). The crude extracts were evaporated under vacuum, washed with MeOH to remove excessive salt, and fully dried under compressed air, yielding the crude extracts. At this point, extracts were resuspended in DMSO to a final concentration of 10 µg mL-1 and were ready to be evaluated for their biological activity. 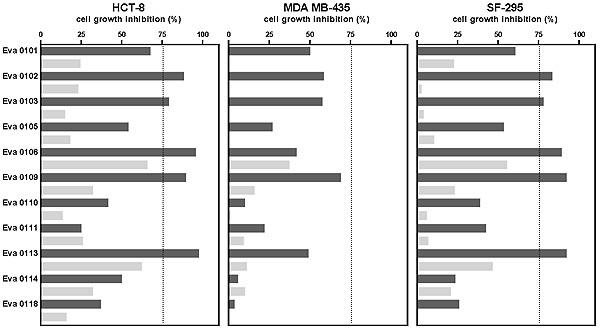 Cytotoxic activity of extracts was evaluated against four human tumor cell lines obtained from the National Cancer Institute (Bethesda, MD, USA): HL-60 (promyelocytic leukemia), MDA-MB-435 (melanoma), SF-295 (glioblastoma) and HCT-8 (colon carcinoma). Cells were grown in RPMI-1640 medium supplemented with 2 mM glutamine, 10% fetal calf serum, 100 µg mL-1 strep-tomycin and 100 U mL-1 penicillin and housed at 37°C with a 5% CO2 atmosphere. The cell cultures were regularly split to keep them in a logarithmic phase of growth. Firstly, in a qualitative approach, cell lines were exposed to 100 µg mL-1 of the extracts for 72 h and the effect on cell proliferation was evaluated in vitro using the MTT [3-(4,5-dimethyl-2-thiazolyl)-2,5-diphenyl-2H-tetrazolium bromide] assay, as described by Mosmann (1983). The extracts that reduced over 80% of cell growth, when compared to non-treated cells, were tested again, in a quantitative manner, however, at concentrations varying serially from 0.02 to 100 µg mL-1 to determine the IC50 (the concentration that inhibits growth in 50%), which was calculated, along with the respective 95% CI (confidence interval), by a non-linear regression using the software GraphPad Prism 5.0. The active extracts (EVA 0102, EVA 0106, EVA 0109 and EVA 0113) were submitted to a preliminary chemical characterization. Initially, these extracts were compared by thin layer chromatography (TLC) on precoated silica gel aluminum sheets (Kieselgel 60 F254, 0.20 mm, Merck) using two different solvent systems (CHCl3 and CHCl3: EtOAc 1:1) and the compounds were detected by exposure to UV (312 and 365 nm) light and by spraying with vanillin/ perchloric acid/EtOH solution followed by heating at 100°C. The extracts were also analyzed by 1H NMR spectroscopy. The 1H NMR spectra were acquired on a Bruker Avance DRX-500 spectrometer equipped with 5 mm inverse detection z-gradient probe. The chemical shifts, given on the δ scale, were referenced to the residual undeuterated CHCl3 (δH 7.27) fraction. The methodology was based in a previous work published by Jimenez et al. (2008). The selected microorganisms were characterized using a molecular approach based on the protocol described by Gontang et al. (2007) with slight modifications. Genomic DNA was extracted from a fresh, 3 to 5 day grown, bacterial culture following the DNeasy protocol (QIAGEN Inc., USA). Amplification of the 16S rRNA gene was carried out with Ilustra™ PureTaq Ready-To-Go PCR beads (GE Healthcare, UK) using the universal eubacterial primers 27F (5'-AGAGTTTGATCCTGGCTCAG-3') and 1492R (5'-TACGGCTACCTTGTTACGACTT-3'). PCR products were purified with MiniElute PCR purification kit (QIAGEN Inc., USA). DNA sequencing was performed by Macrogen Inc. (Seoul, Korea) using the ABI PRISM BigDyeTM Terminator Cycle Sequencing kit (Applied Biosys-tems, USA) and the same primers used for amplification, following the protocols supplied by the manufacturer. The nucleotide sequences were assembled, analyzed and manually edited using the BioEdit Sequence Alignment Editor (Hall, 1999) and compared to sequences within the NCBI database (http://www.ncbi.nlm.nih.gov) using the Basic Local Alignment Search Tool (BLAST). The identity of the strain was confirmed after an evaluation of the phylogenetic relationships with the most similar sequences obtained from the EzTaxon server (Chun et al., 2007). The sequences were aligned using Muscle ver. 3.6, and the reconstruction was performed using a combined bootstrapping and maximum likelihood approach through RAxML (Stamakis, 2006) on the CIPRES portal (Miller et al., 2010). The tree was produced using Archaeopterix ver. 0.957 (Han & Zmasek, 2009). After the phylogenetic analysis, the sequences were submitted to NCBI GenBank. Twenty colonies were isolated from E. vannamei respecting their actinomycete-like distinctiveness. Out of those, 11 were elected for cytotoxicity evaluation on tumor cells. In the single concentration screening, extracts obtained from strains EVA 0102, EVA 0103, EVA 0106, EVA 0109 and EVA 0113 were the most active, reducing proliferation of HCT-8 and SF-295 cells in over 75% (Fig. 1). Figure 1. Qualitative cytotoxicity screening of EtOAc extracts from liquid medium (dark gray) and MeOH extracts from biomass (light gray) of bacterial strains isolated from E. vannamei. Extracts were tested (100 µg mL-1) against HCT-8, MDA-MB-435 and SF-295 cell lines by the MTT assay after 72 h incubation. Data were obtained from two independent experiments and presented as a percentage of growth inhibition relative to untreated cells. The IC50 was determined for the extracts obtained from EVA 0102, EVA 0106, EVA 0109 and EVA 0113, since the yield of the extract from EVA 0103 was insufficient for further analyses. The tested extracts showed a similar activity profile, with little variation in potency. As shown on Table 1, EVA 0109 yielded the most cytotoxic extract, with IC50 values varying from 3.62 to 23.78 µg mL-1. EVA 0113 followed, with IC50 ranging from 9.97 to 30.07 µg mL-1. Table 1. Cytotoxic activity of EtOAc extracts obtained from bacterial strains isolated from Eudistoma vannamei evaluated by the MTT assay after 72 h incubation. IC50 values and their respective 95% confidence intervals were obtained by nonlinear regression on the GraphPad Prism 5.0 software (Intuitive Software for Science, San Diego, CA). N.T. : not tested. The extracts from EVA 0102, EVA 0106, EVA 0109 and EVA 0113 were similar on TLC and, as expected, showed the same spectroscopic profile by 1H NMR. For this reason, just one 1H NMR spectrum was depicted (Fig. 2). After a detailed analysis, it was clear the presence of chelated hydroxyl groups (δ 15.4412.29), aromatic and/or olefine hydrogens (δ 8.415.92), hydrogens bound to oxygenated carbon (δ 3.643.54), as well as methylene, methyne and methyl protons (δ 2.34-0.83) (Silverstein et al, 1991). Figure 2. 1H NMR spectrum (500 MHz, CDCl3) of the EtOAc extract from EVA 0102. The aforementioned data were compatible with the presence of quinones or related secondary metabolites. The analysis of the 16S rRNA from the 5 EVA bacterial strains revealed a high degree of similarity among them (Fig. 3). When included in a reconstruction of the phylogeny along with the most similar sequences found on Genbank, the EVA clade came out as the sister group of a clade formed by Micromonospora echinospora, M. marina, M. auran-tiaca, M. halophytica, M.humi, M.purpureo-chromogenes, M. coxensis, M. chalcea and M. tulbagihiae. The EVA clade was formed with a relatively high support value and EVA 0109, 0113, 0102 and 0106 showed a higher degree of overall similarity. For this clade a single contig was then generated and deposited on NCBI GenBank under accession number JN797618. The sequence from EVA 0103 is slightly different, so it was deposited with a separate accession number (JN797619), despite its 16S rRNA sequence is still more than 99.9% similar to the other EVA strains. Figure 3. 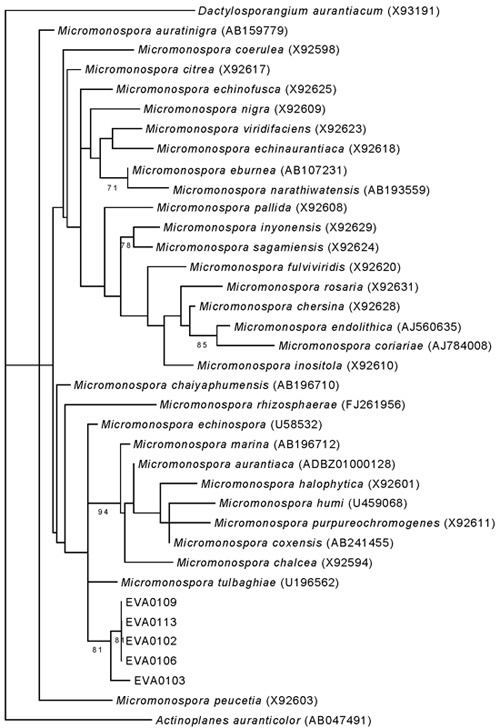 Maximum likelihood tree of the Micromonospora lineages isolated from E. vannamei and most similar species. Dactylosporangium and Actinoplanes were used as outgroups. The study herein began with a screening for cytotoxicity among actinomycetes isolated from the tunicate E. vannamei. The active extracts showed identical 1H NMR profiles and the respective strains were identified based on a molecular biology approach, where all five isolates were identified within the genus Micromonospora. The results pointed to at least two species of Micromonospora producing cytotoxic compounds associated with E. vannamei. Micromonospora are a well-known group of Gram-positive, spore forming microbes, and are considered the most abundant actinobacteria, along with Rhodococcus and Streptomyces in marine environments (Maldonado et al., 2005). Additionally, they are long accepted as an important source of antibiotics and other substances with commercial value. For instance, some of the best-known antibiotics, such as the aminoglycosides amikacin, gentamicin and netamicin, were initially isolated from these microorganisms (Berdy, 2005). Furthermore, Micromonospora species with marine occurrence have yielded many compounds with biomedical relevance. Thiocoraline is produced by a strain of M. marina isolated from a soft coral collected near the coast of Mozambique (Romero et al., 1997). This cyclic thiodepsipeptide showed strong cytotoxic activity against various tumor cell lines, with IC50 around 2nM. Moreover, thiocoraline induced cell cycle perturbations due to inhibition of DNA-polymerase activity (Perez-Baz et al., 1997; Romero et al., 1997; Erba et al., 1999). Other example is diazepinomicin, a dibenzodiazepine alkaloid with antimicrobial properties isolated from a Micromonospora strain recovered from Didemnum proliferum, a tunicate collected off the Japanese coast (Charan et al., 2004). In fact, associations of Micromonospora and other actinomycetes with tunicates have been documented elsewhere (Menezes et al., 2010). The Fijian tunicate Polysyncraton lithostrotum is the host to the then unidentified species M. lomaivitiensis, the producer of the potent anticancer compounds lomaivitins A and B (He et al., 2001). These molecules also have antimicrobial activity, which is thought to scare off other bacteria (He et al., 2001). The results presented here, showing the cytotoxicity of a Micromonospora strain and describing its association with the Brazilian endemic ascidian E. vannamei, highlight their potential as producers of relevant molecules. The chemical profile of Micromonospora extracts was different from the one observed by Jimenez et al. (2008) for E. vannamei extracts. While the active compounds presented in ascidian extracts correspond to tryptophan derivatives, spectra data generated for the bacterial extracts herein hinted on the presence of quinoid-like compounds, such as anthracyclines or anthracyclinones (Pretsch et al., 2000; Laatsch & Fotso, 2008). This data suggested that the isolated Micromonospora strain is not responsible for the production of ascidian bioactive compounds. Nonetheless, the activity was similar for both ascidian extract (IC50 ranging from bellow 2.00 to 23.80 µg mL-1, Jimenez et al., 2008) and bacterial ones (IC50 ranging from 3.62 to 84.65 µg mL-1). The occurrence of anthracyclines or related compounds withholding some sort of bioactivity is rather common within the Micromonospora genus. M. lupini yielded the anti-cell invasion anthraquinones lupinacidins A, B and C (Igarashi et al., 2007, 2011). The anthracyclines micromonomycin (Yang et al., 2004) and spartamicins A and B (Nair et al., 1992), produced by different strains of Micromonospora, have antimicrobial and antifungal properties, respectively. Moreover, the previously mentioned lomaivitins are hybrid molecules flanked with naphtoquinone moieties (He et al., 2001). Finally, it can be concluded that acnitomycetes isolated from the Brazilian endemic ascidian E. vannamei are a promising source of bioactive compounds. Therefore, additional studies are in progress to resolve the active principles and to characterize the means by which they may exert cytotoxicity. This work has been supported by Conselho Nacional de Desenvolvimento Científico e Tecnológico (CNPq), Financiadora de Estudos e Projetos (FINEP) and International Foundation for Science (IFS). The authors also wish to thank Silvana França, for technical assistance with the cell cultures, and M.Sc. José Gustavo de A. Lima for generating and editing the 1H NMR spectra.